"Adwords is coming back," an addiction executive told me. "We want to make sure we save some budget for that." 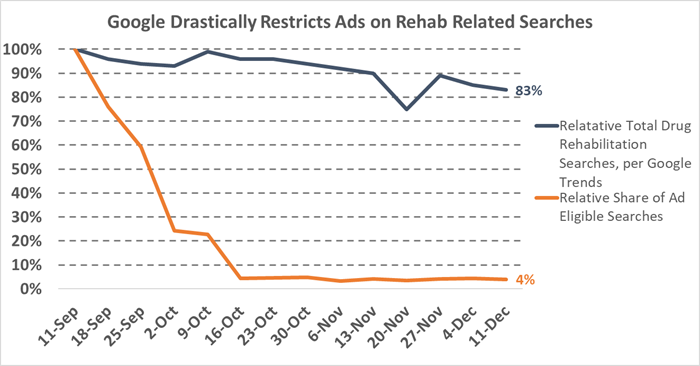 As I wrote last September, Google "lowered the hammer" on addiction treatment centers on its Adwords platform, curtailing treatment ads completely by January of 2018. Reactions to the ban were as varied as they were hilarious. Plenty, who had relied on PPC - or "pay per click" advertising - to fill their census, were bemoaning the ban. Those who relied on Adwords too heavily were suddenly facing an existential threat. Still others who provided non-Adwords services like SEO, wrote "it's about time" articles. And we saw a rush to fill-the-void, and many treatment centers and marketers experimenting with Facebook. Offering Facebook ads during the Fall Of Adwords gave us at Admit Scout an interesting vantage point. For months, only a few agencies claimed to be able to duplicate Adwords results on Facebook, and it was impossible to verify their performance, but you couldn't find a treatment center who had seen Facebook ads work successfully. Beginning around January of 2018, we started hearing that a lot of agencies were starting to make the same pitch we were - "we just talked to another agency this week who told us exactly the same thing you did". Then, in March, just as we were publishing our first case studies, we began to discover a few other agencies who claimed, credibly, to have achieved results with Facebook. Now, after Reuters and others dropped the bomb that Adwords is coming back, it will be fascinating to see how many agencies still claim to be able to generate results with Facebook. And, given that you're reading this article, you're probably wondering: now that Adwords is back, is it still worth considering Social Marketing? Or should you shift all your resources to Google. Adwords Isn't Going To Be "Less Competitive"
What many will forget is that, even before the ban, Adwords was competitive and expensive, and getting more-so. We at Admit Scout used to do Adwords, and we were exploring the Facebook ads funnel even before Google unveiled the ban. When we would ask centers how much their average CPA was on Adwords, we would hear $7-10,000. Adwords was, and still is, a keyword auction. You bid against others - many with deep pockets - for Google to display your ads to people searching your keywords. ...and any competitor could see exactly what keywords you were using with a software like Spyfu. Now that Adwords is coming back, Google is requiring third-party certification (more on which later), and the "magical thinking" I've read in a couple of sources is that the price of certification will be an obstacle that reduces competition, as centers who would traditionally bid up the price of keywords find it prohibitively expensive to get certified. Yea - it sounded ridiculous to me too. Any center who can afford to outbid you can obviously afford a few-grand-a-year to get accredited. The other myth is that now that Google requires certification, competition will be lower because the onerous cert process will keep the unscrupulous players - the "patient brokers" - out of the game. We've had a script cataloging 100% of paid search results for every addiction-related keyword since last March, and here's the inconvenient truth: the top-bidders were mostly reputable centers. What might be true is that the limited number of centers third-party verification companies can certify at-any-one-time will temporarily keep competition lower. But, unless you're already certified, that probably just means you're going to be waiting longer than you'd hoped for Adwords certification. Adwords, post-certification-requirement, is an ever-growing playground of legitimate centers with the deep pockets to get certified, and the connections to get certified first. On the other hand, I predict we will see a dip in the number of Facebook ads for treatment facilities. Just to be crystal-clear, we at Admit Scout have a dog in this fight, as one of the pioneer firms for Social Marketing. But (1) we chose to specialize in Social Marketing for the reasons I'm describing in this article, and (2) it's not like we couldn't go back to offering Adwords if we thought it was the better channel. In fact, we're considering it too. So I'm sharing our best thinking in this article, and if I were a betting man, I'd put my money on social advertising as the better channel. It's too soon to tell, but my guess is that we'll see that number trending back down in the first few months of the summer. I've detailed why in other places, but to summarize, Adwords is easier than Facebook. ...and hope the cost-per-click doesn't get too high to afford. Facebook, by contrast, is hard. ...so you have to find "clever" ways of showing your ads to the right people. Adwords favors Big Dumb Money. Once you figure out whom to show your ads to, there's no easy way for your competitors to spy on you. ...but there's no tool equivalent to Spyfu that allows them to see to whom you're showing your ads. With Adwords, you're bidding against deep-pocketed competitors for "best alcohol rehab Orange County". With Facebook, you're researching interests, using lookalike audiences, and using systematic trial-and-error to find a few "secret" pockets of people to whom you can advertise profitably. With branded social ads (ads that are sponsored directly by the treatment center, instead of a third-party "lead aggregator"), different centers will appeal to different people. Some want centers close-to-home, while others want to get away from the routines and people keeping them "in a rut". Some want 12-step-based treatment, while others want to avoid it. ...and others are looking for something "in network" they can afford, that's head-and-shoulders above most of the other options. ...might not work for another. But that means practically every treatment center can have its own mostly-unique audience. Sure - there will be some overlap. But not much. That lessens the "rehab tourist" phenomenon many centers have complained to us about. "You have to assume your potential client has seen an ad before your ad, and they're going to see another ad after your ad." That's never-more-true than with Adwords. Think about it: by the time you're Googling a solution to a serious problem - be it medical, psychological, or both - your biggest concern is not "do I need this solution". It's "which of these many options should I chose." And you're going to make a snap-judgment. Contrast that with when you're still judging if you have a problem. If someone helps you solve part of your problem, you're more likely to trust them when it's time to invest in a complete solution. That's what we're doing with social advertising. Offering somebody some (genuinely) helpful content. Following up to stay on their radar. Reminding them gently that you can help. The above factors are true even if the number of advertisers on Facebook stays-the-same, or continues to increase. I'll go ahead and say it: charging money to adjudicate potential Adwords advertisers, then continuing to charge a renewal fee, is a great business to be in. ...and the centers, who benefit from differentiating themselves from the unscrupulous players. But it's "pay to play", and if I had to predict, I'd say you're likely to see agencies and lawyers accepting money to help time-poor CEOs navigate the compliance waters. More gatekeepers just means more reasons Adwords is less stable than before, which is a good reason to diversify. We'll continue to stay on-top of industry goings-on with regard to Adwords. Here's an article that goes into greater depth about the social marketing funnel. Newer PostIs The Addiction Treatment Industry Really Going to Let John Oliver Define It?